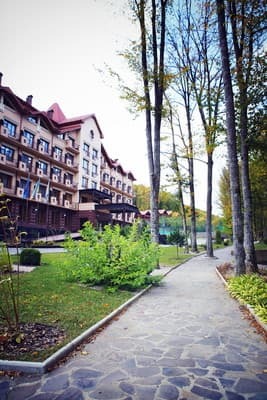 Sanatorium "Solva" is located in the famous balneological resort of Polyana, in the picturesque valley of the river Pinya. On the territory of the sanatorium there is a SPA complex: an indoor swimming pool with a jacuzzi and a hydromassage department, a sauna complex (a Finnish sauna, a Turkish bath, a Russian bath), a special cold pool (between Finnish and Turkish baths). 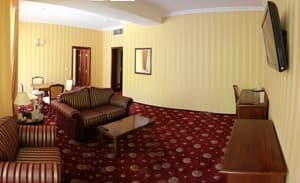 Description of the room: 22 m2, combined bathroom with shower, bathrobes, hairdryer, double bed, desk, TV (cable), air conditioning, mini-bar. Extra bed (1) is a clamshell. 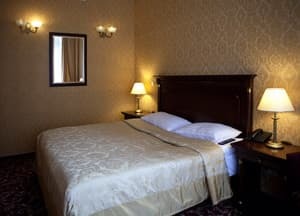 Description of the room: 22-24 m2, combined with / with a shower, bathrobes, hairdryer, double bed, desk, TV (cable), air conditioning, mini-bar. 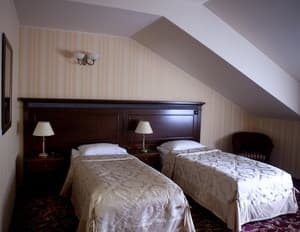 Description of the room: 30 m2, combined bathroom with shower, bathrobes, hairdryer, two separate single beds, desk, armchairs, TV (cable), air conditioning, mini-bar. Extra bed (1) is a clamshell. 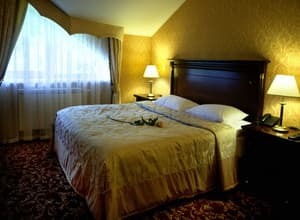 Description of the room: 33 m2, combined bathroom with shower, bathrobes, hairdryer, two separate single beds, desk, armchairs, TV (cable), air conditioning, mini bar, balcony. Extra bed (1) is a clamshell. 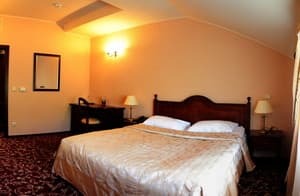 Description of the room: 38 m2, combined bathroom with shower, bathrobes, hairdryer, double bed, desk, sofa, safe, TV (cable), air conditioning, mini bar, two balconies. Extra bed (2) - sofa. 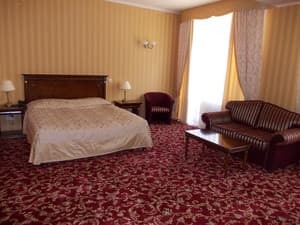 Description of the room: 38 m2, combined bathroom with shower, bathrobes, hairdryer, double bed, desk, sofa in the living room, safe, two TV (cable), air conditioning, mini-bar. Extra bed (2) - sofa. 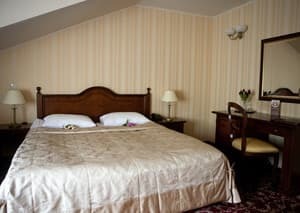 Description of the room: 40 m2, combined bathroom with shower, bathrobes, hairdryer, double bed, desk, sofa in the living room, safe, two TV (cable), air conditioning, mini bar, two balconies. Extra bed (1) - sofa. 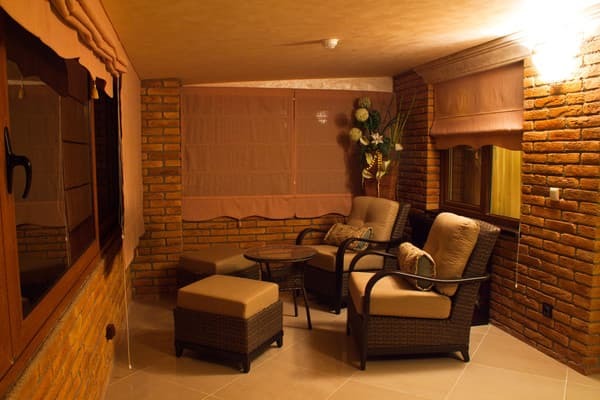 Description of the room: 63 m2, two combined bathrooms with shower, bath and bidet, bathrobes, hairdryer, double bed, desk, couch in the living room, table-top furniture, safe, two TV (cable), air conditioning, mini bar, two balcony, terrace with wicker furniture. Extra bed (2) - sofa. Additional place - 400 UAH (with breakfast). In the form of a bed. 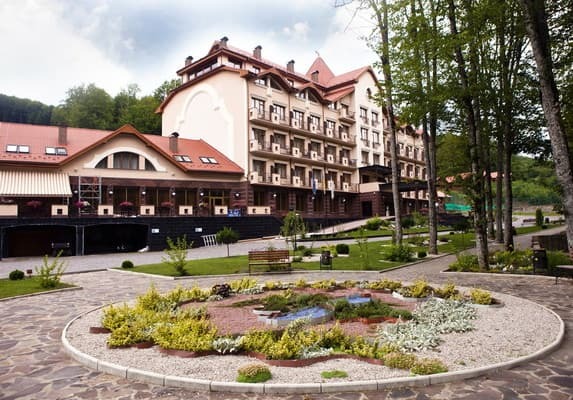 On the territory there is a kolyba of Transcarpathian cuisine, in the building there is a restaurant. The cost of breakfast is 150 UAH, lunch is 200 UAH, dinner is 180 UAH. 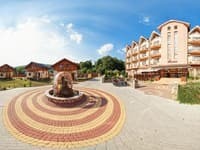 In the famous balneological resort of Polyana, in the picturesque valley of the Pina River, which is located in the Svalyava basin (foothills of the Ukrainian Carpathians), 11 km from the district center - the city of Svalyava, at an altitude of 320 m above sea level. The nearest ski lift is 2.5 km (Mount Vedmezha). 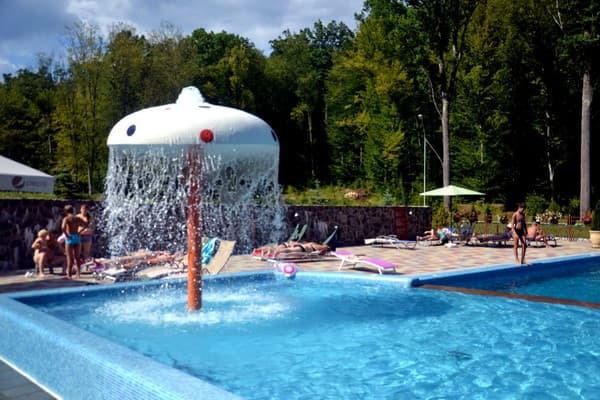 The highlight of the hotel-recreation complex "Svalyava-SOLVA" is a pump room with medicinal mineral water from the Polyanskoye mineral water deposit. This mineral water is used in the treatment of gastritis, gastroduodenitis, peptic ulcer of the stomach and duodenum, that is, it shows 75-80% of all gastroenterological patients, who need sanatorium treatment. In addition, the water "Glade Kvasova" is used in the treatment of diseases of the hepato-biliary system (hepatitis, cholecystitis, etc. ), pancreas (pancreatitis), urinary system (oxaluria and uraturia), metabolic diseases (diabetes, gout). 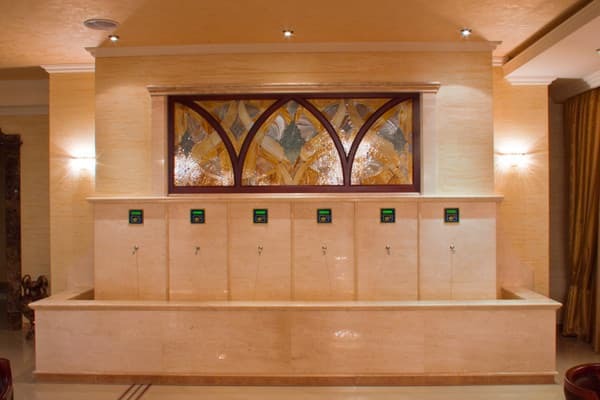 For balneotherapy (in the form of mineral baths), our mineral water is prescribed for the treatment of diseases of the cardiovascular system, central and autonomic nervous systems. In the form of intestinal procedures - for the treatment of bowel diseases. In the form of inhalations - for the treatment of diseases of the upper respiratory tract. From Kiev: Option 1. By train. By train # 007 / № 525K "Kiev-Chop" to the station Svaliava; By trains No. 081К, № 099К, № 505К, № 207К, № 537К, № 531О "Kiev-Uzhgorod" to the station Svaliava; Further by shuttle bus or bus to the village of Polyana (11 km). Option 2. By car. By car on the highway M06 Kiev-Chop through the cities of Zhitomir, Rivne, Lvov to the village of Nizhnie Vorota, Zakarpattya region (714 km). After the village of Nizhnie Gorya, turn smoothly onto the T0709 / T1409 road. Drive along the road T0709 / T1409 25.3 km to the village of Polyana. Option 3. By plane to the city of Lviv From Lviv to Glade 200 km - 3 hours by car or 4 hours by bus. By train: Lviv - Mukachevo to the stop station. Svalyava, then by shuttle bus or bus to the village of Polyana (11 km). You can order a transfer from Svalyava or Mukachevo (cost to clarify).